If Facebook itself isn’t a covert dating site, then at least its social graph could be — a big group of startups have been going for this honeypot of user data and connections ever since the company launched its platform back in 2007. Few have really taken off, and incumbent dating sites like the not-so-social Match.com have continued to hold mindshare with date-seekers. This is where theComplete.me sees the opportunity. The company quietly launched a Facebook app in March that pulls in and analyzes data from Facebook and other social sites to figure out who you might be a good fit with — and goes way beyond most rivals in its effort to undermine the incumbents. Led by Brian Bowman, the former vice president of product at Match.com, it’s also announcing a large $1.22 million seed round from Intel Capital, psuedo-rival dating site PlentyofFish (a strategic investor in this case), the CrunchFund, and a list of prominent angels. Here’s a closer look at what’s getting all these online dating pros so interested. The app first has you sign on with your Facebook identity, then it shows you a list of people who may have interests in common in a Pinterest-style interface. Your own profile data is organized into a feature called “fraMEs,” — pinned frames that show categories such as Liked Facebook pages, that can be easily edited beyond the pre-populated Facebook data. A top row of thumbnails shows other Facebook users in the app that theComplete.me has determined are potential matches for you. Clicking on them reveals the things you have in common, also Pinterest style — including the ability to comment on Page-based interests like Neil Young or the Outside Lands music festival. But there’s a lot going on under the surface. Matches are based on a wide range of factors including people you view, who people like you view and correspond with, the number of messages you send and receive from people, and other behavioral data. The product also figures out generally shared interests, like if you and another person both like action movies, because you each have Liked the page for the movie The Matrix, for example. The app goes further than Facebook, too. Once you’re logged in, you can also connect with LinkedIn, Twitter, Google+, Photobucket, Flickr, Foursquare, GoodReads, and Instagram. It then pulls in unique data about you from each service (who follows you on Twitter, the types of places you check in on Foursquare) to figure out even richer matches. In private beta testing so far, it has amassed some 1.5 million profiles of users and their friends, which is already helping to shape recommendations. It also pulls off a very clever move to disrupt the utility dating sites, that I haven’t seen done by any of its rivals. Users can provide the IDs to their profiles on other sites, including Match.com, eHarmony, Zoosk and other big ones. You can see the results in aggregate if you click on the “Dating Sites” link of the top “Search People” tab in the app. You get direct, free access to other users of these dating sites because you can just message them through the app/Facebook. No need to pay the one-time or monthly fees that Match.com and others charge. Beyond undercutting the business model, Bowman points out that most of these other sites provide basically no social context beyond what users manually share. At the same time, theComplete.me preserves anonymity. Users only see each others first names initially, and nothing gets posted to Facebook for others to see (unless you manually enable it to do that). Going forward, the business model is going to include microtransactions around things like “buying” an ad next to interests. If you really want to find all the ladies on the app going to Outside Lands, you could advertise yourself next to that fraME, for example. But the core app, Bowman says, will remain free. TheComplete.me does have a few challenges. 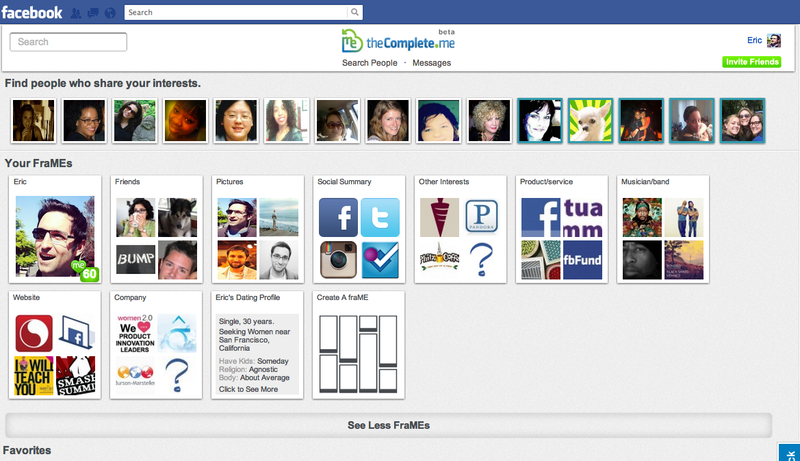 The interface hides some of the cooler features, like the social network syncing and dating site finder. And the Pinterest interface felt a bit clunky at some points. There’s work to be done in this area. And other new dating apps are also doing a good job of creating matches using social data (like Yoke, which Josh has fallen for pretty hard) and Circl.es. But the experiences of the founding team and its supporters could help them navigate the many nuances of getting the app right for the dating use case. Beyond the previously-listed investors, angels include Russ Siegleman, Ben T. Smith IV, Social Starts, LLC, Spark Unlimited, Inc., Parker Coddington, Kevin Henrikson, Ali Jahangiri, William Lohse and Konstantin Othmer. Disclosure for my girlfriend: I was only testing this app out for work. No dates were had during the production of this article.